The lobby features marble from around the world. Opened in 1928, the Plummer Building is an iconic symbol of Mayo Clinic, designated as a National Historic Landmark. It is named for Henry S. Plummer, M.D., the “diversified genius” who designed it and who created many of the systems and procedures – such as the medical record and registration system – still in use at Mayo Clinic today. Dr. Plummer wanted the building to be efficient as well as aesthetically pleasing. Medical specialties were located throughout the 15-story building to facilitate easy movement of patients and collaboration among colleagues. An extensive library housed books and medical journals necessary for the growing staff. Medical records traveled throughout the building via a pneumatic tube system. Although patient care has shifted to the Mayo and Gonda buildings and other facilities on the Rochester campus, the Plummer Building remains an integral part of Mayo Clinic, accommodating many administrative, academic and support functions. The bell tower is lit at night, highlighting the building’s ornate architectural style. During the holiday season in the 1950s and ‘60s, the south wall was illuminated with colored lights that evoked a Christmas tree. This custom was revived during the Mayo Clinic Sesquicentennial of 2014 and continues today. Learn more about lighting of the Plummer Building. The tower is a focal point of Rochester’s skyline. Bas relief caricatures – These images provide visual variety on the lower levels of the building’s exterior and represent themes ranging from St. George, the patron saint of England, slaying the dragon (honoring the Mayo family’s English ancestry) to a happy elephant and sad donkey (reflecting the presidential election of 1928, the year the building opened, when Republican Herbert Hoover defeated Democrat Al Smith). Bronze doors – Standing 16 feet high and weighing 4,000 lbs. each, they are always open, closing only for great solemn events such as the death of Mayo Clinic leaders and national tragedies. In earlier years, Joe Fritsch, nicknamed “Joe Clinic” served as doorman and unofficial goodwill ambassador. 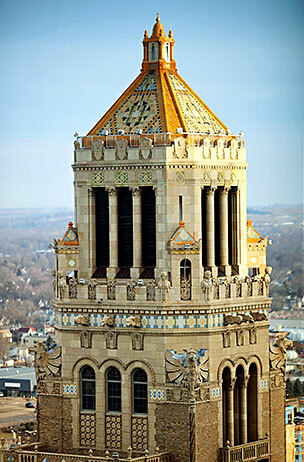 Carillon – Mounted in the tower of the Plummer Building, the 56-bell carillon brings the gift of music to downtown Rochester. Learn more about the Carillon. 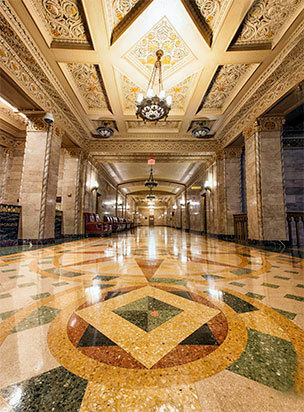 Lobby – Marble from around the world adds beauty to this area. A mosaic of inlaid marble highlights the large registration counter. Note the bronze tablet on the wall near the lobby entrance. On August 8, 1934, President Franklin D. Roosevelt presented the plaque to the Mayo brothers on behalf of the American Legion. Elevators – The elevators were originally run by an operator whose job it was to safely bring patients and staff to the various floors. Now automatic, the elevators still retain their vintage charm.